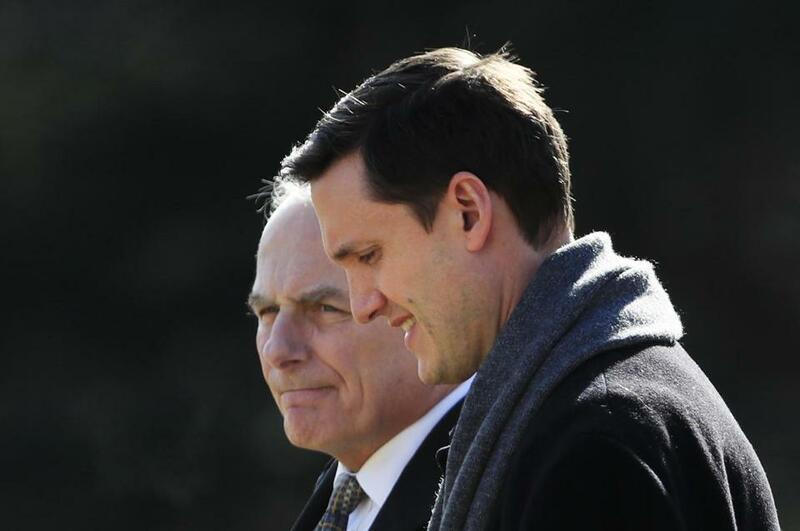 Officials have said that White House chief of staff John Kelly (left) was aware of the broad allegations against Rob Porter for months. WASHINGTON — Contradicting the White House, the FBI said Tuesday it gave the Trump administration information on multiple occasions last year about a top aide accused of domestic abuse by his two former wives, and the investigation wrapped up in January. That account by FBI Director Christopher Wray challenged the White House assertion that Rob Porter’s background ‘‘investigation was ongoing’’ and officials first learned the extent of accusations against him only last week, just before he abruptly resigned. The weeklong fallout from the allegations against Porter, President Trump’s staff secretary, has thrown the West Wing into chaos not seen since the earliest months of the administration and has sparked new rounds of recriminations inside the White House. Privately, officials acknowledge that the public timeline offered last week — that the administration first learned of the former wives’ charges against Porter last Tuesday — was flawed at best. Kelly found out after requesting an update on the large number of senior staffers operating without full security clearances, according to a senior administration official who spoke on condition of anonymity to discuss internal discussions. McGahn told Kelly last fall there was concern about information in the background investigation involving Porter’s former wives, the official said, and Kelly expressed surprise that Porter had previously been married. White House press secretary Sarah Huckabee Sanders told reporters Monday, ‘‘The White House had not received any specific papers regarding the completion of that background check.’’ Yet Wray testified that the FBI sent the White House its preliminary report in March 2017 and its completed investigation in late July. Soon after that, the agency received a request for a follow-up inquiry, and it provided that information in November. Porter was interviewed about the allegations in September, an official said. ‘‘And then we administratively closed the file in January, and then earlier this month we received some additional information and we passed that on as well,’’ Wray added in his congressional testimony Tuesday, without elaboration. ‘‘We find those statements to be consistent with one another,’’ she said. The White House has refused to divulge the number of staff members who still do not have full clearances, though the list includes Jared Kushner, the president’s senior adviser and son-in-law. Kushner’s attorney, Abbe Lowell, said in a statement that ‘‘there are a dozen or more people at Mr. Kushner’s level’’ who are working without full security clearances. Separately, Trump’s intelligence chief called for top-to-bottom reform of the security clearance process, which allowed Porter to operate in his job for more than a year with only an interim clearance. ‘‘We have a broken system and I think everybody’s come to agree with that now,’’ Dan Coats, the director of national intelligence, told The Associated Press. He called for limits on the information made accessible to those with temporary clearances — a practice that is currently not followed in the West Wing, an official said. Meanwhile, Colbie Holderness, Porter’s first wife, pushed back against comments made by presidential counselor Kellyanne Conway that seemed to suggest strong women can’t be victims of domestic violence. Conway went on to say that ‘‘there’s no question’’ that domestic violence ‘‘knows no demographic or geographic bounds,’’ and she understands there is a stigma that surrounds these issues. Porter resigned after Holderness and his second former wife, Jennifer Willoughby, came forward with allegations of emotional and physical abuse. Porter has denied harming his former partners.